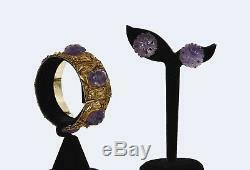 1930's Chinese Gilt Silver (tested silver with silver test kit) Filigree Amethyst Carved Cabochon Bracelet & Earrings Marked. The bracelet is 6.7 inches (17 cm) in inner circumference by 2.28 inches (5.8 cm) in inner diameter and 1.11 inches (2.8 cm) wide by 9.58 mm thick. 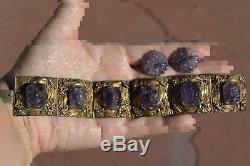 The amethyst is about 0.6 inch (1.6 cm) long by 0.5 inch (1.2 cm) wide. It is 53.9 gram. The earrings are 0.8 inch (2 cm) wide. They weigh 7.5 gram. The total weight including the bracelet is 61.4 gram. 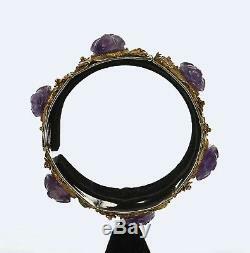 The amethyst carvings have flea bite chips, surface wears and scratches, and inclusions. 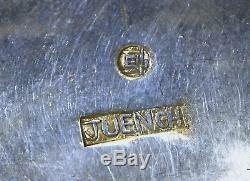 The silver is tarnished and has rubbing of gilt, surface wears and scratches, oxidation, and missing pieces (as seen in the photos). Some of the photos were taken under the sun. How we pack your item is at our discretion. We will pack your item(s) as soon as possible. Please have patience with us. THIS WILL NOT HELP YOU TO PUT YOUR ITEM AT THE FRONT OF THE QUEUE INSTEAD WE WILL PUT YOUR ITEM AT THE END OF THE QUEUE OR WE WILL CANCEL YOUR ORDER! For porcelain and fragile items, we will use double boxes with plenty of packing peanuts and bubble wraps to pack. You have only two choices. Keep the item or return the item. Please retain all the packing materials including the boxes. Please take photos of the damage areas and the outside box. We will submit all the information to the insurer for claims. You will be required to sign an affidavit to attest the information submitted. If the item suffered only partial damage, the insurer will pay for the partial loss or repair cost. You will need to provide an appraisal to prove the loss of value if you wish to claim partial loss. If you wish to claim restoration cost, you will need to provide an estimate written by a restorer. The price will be at market price to be determined by the consignor. The price will always be more and never less. Please note that we have provided studio photos and sunlight photos in some items. However, there might be some color variations due to the difference in different computer monitors and different lighting. Please also note that we may post additional photos after we list our items. So, please scroll all the way down to look for additional information and photos posted. The item "1930's Chinese Gilt Sterling Silver Filigree Amethyst Carved Bracelet & Earrings" is in sale since Friday, October 12, 2018. This item is in the category "Antiques\Asian Antiques\China\Bracelets".